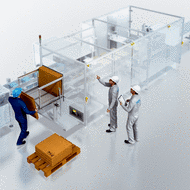 Safety solutions from SICK offer comprehensive, flexible protection for numerous applications. Certified experts adapt the solutions to the individual requirements on site and implement them quickly and efficiently at every stage – from the concept to acceptance. In addition to technical protective devices, SICK safety solutions also comprise the associated engineering services.